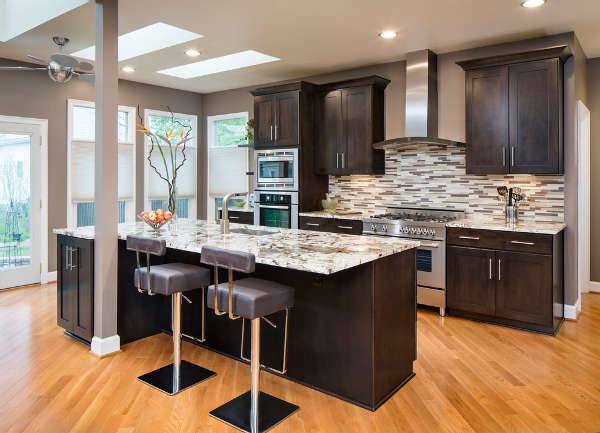 The modern country kitchen is a combination of both the modern day gadgets such as high tech stoves, ovens, stylish light fixtures with a combination of rustic wooden flooring, shaded and bright orange and blue colors here and there. White always brings the country look. The leather upholstery , the white painted rustic table and the whole kitchen in white takes the kitchen back to 50 years. The furniture in the kitchen has always been important in bringing the right kind of look whether it may country look or modern look. Simple Wooden furniture such as a simple dining table with wooden stools, old model stand alone cupboards in shades of gray and white bring country look to the kitchen. 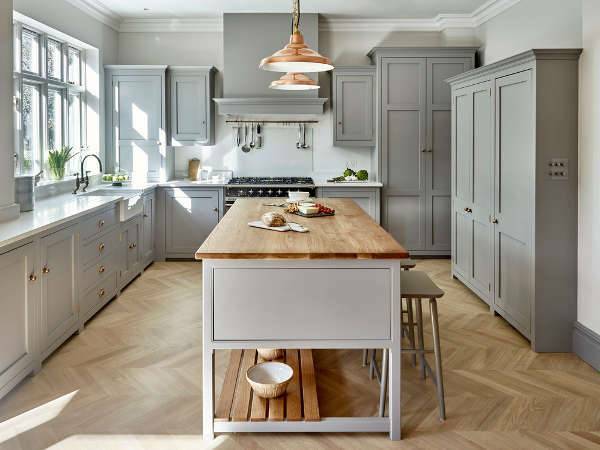 The vintage look is possible by having a coat of natural varnish t the furniture in the kitchen whether it may be a dining a table, the cabinets etc. 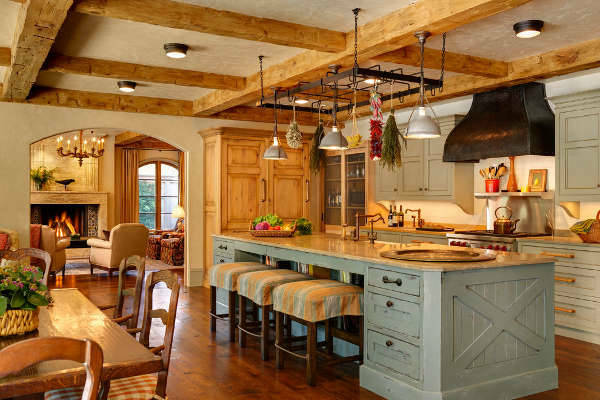 Having wooden beams in the roof and some touch of copper and iron brings the vintage look to the kitchen. 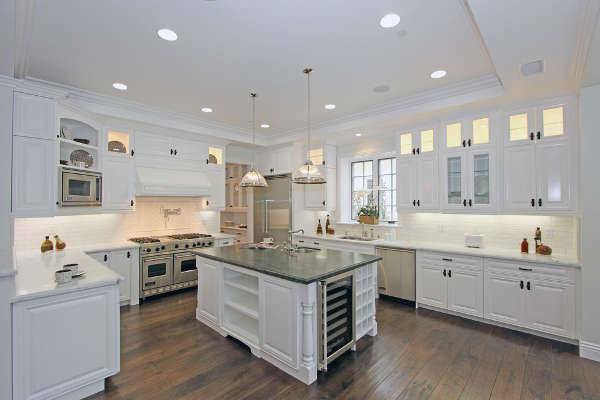 The white cabinets, the furniture in white color, white ceiling and walls painted in white bring a country look to he kitchen. The vintage chandeliers, the wooden flooring and some vegetables and fruits placed in some copper or wooden bowls adds up to the country look. 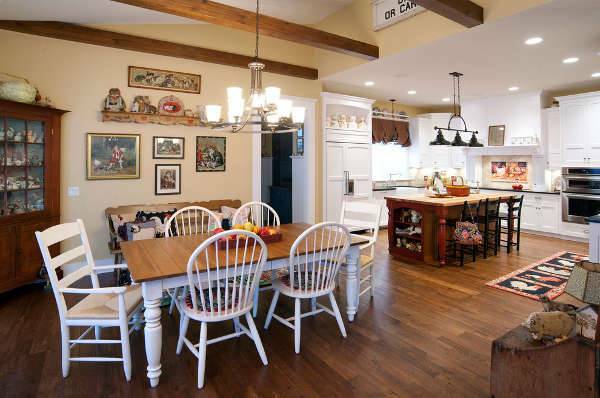 The rustic country kitchen has that raw look with less shiny cabinets and furniture as seen in the above picture. 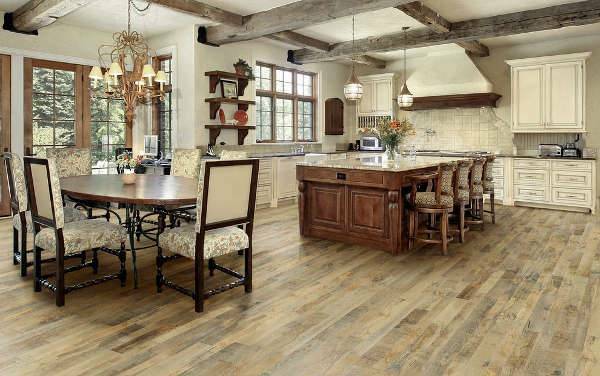 The wooden flooring is left as it to make it look old, the windows and other furniture with antique look, the chandeliers, antique finish cabinets in white or wood color brings a rustic look to the kitchen. For obtaining a country look, it is always good to choose lighting fixtures in cast iron or some metal. The design of the fixtures should have a vintage look which adds up to the country look. 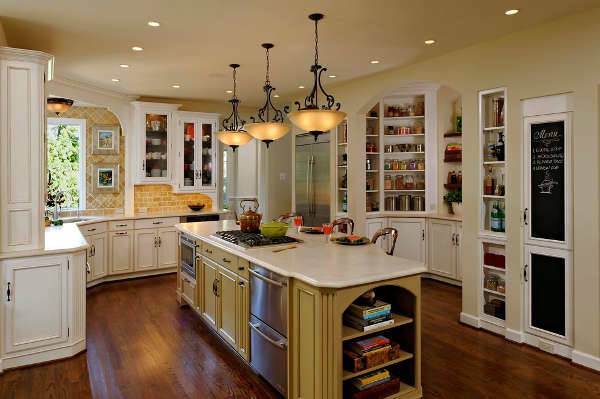 The lighting should be dull and not so bright which brings ambiance and county feel to the kitchen. 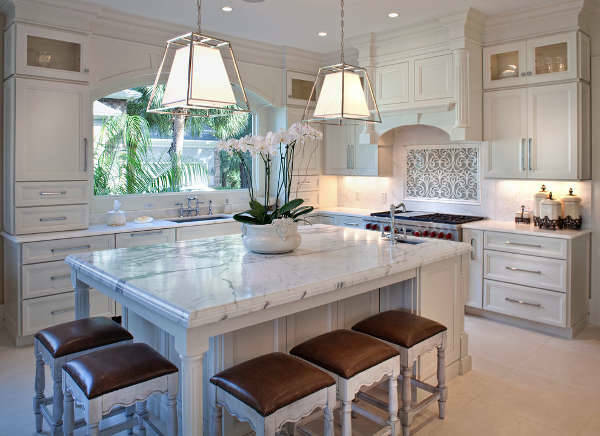 The kitchen tables play an important role in bringing the look for any kitchen. For a country kitchen look, the kitchen tables need not have a sophisticated look with glass and steel. 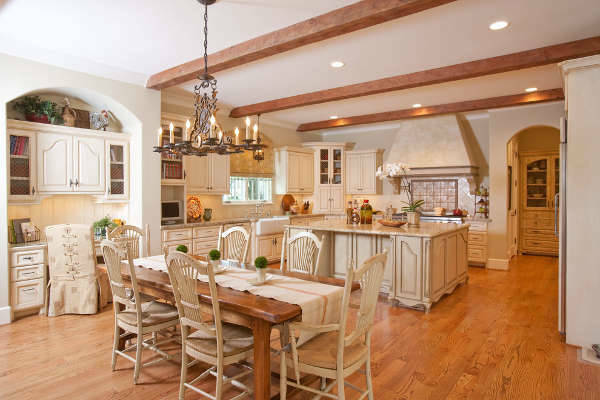 Simple kitchen tables in wood with white or natural paint brings the feel of country kitchen. Bringing the country look to he kitchen can be done in man ways. By placing a mud vase with some sunflowers, a wooden bowl or mud bowl with vegetables, fruits etc. brings a country look even to a modern kitchen. 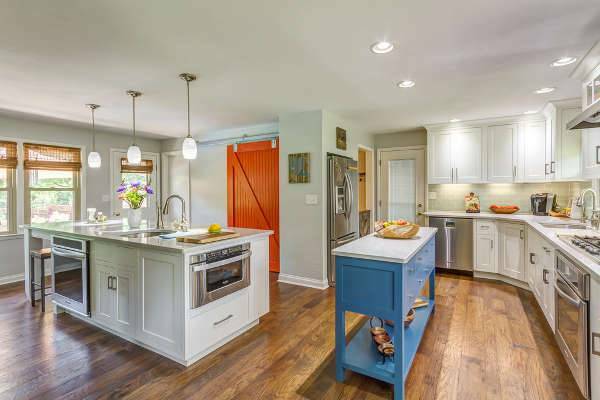 The alterations such as painting the doors and windows of the kitchen in bright oranges and blues will bring a huge difference in the look of the kitchen. The modern kitchen can have some changes in the furniture such as having the kitchen table with antique look which brings a huge change into the kitchen. Te changes can be simple ones or huge changes can be taken up to bring the country look to the kitchen.